Sony Xperia Miro UK release date pegged for August? Update: TechRadar has now spoken to Carphone Warehouse and a spokesperson said: "The Sony Xperia Miro will not be arriving until mid-September. The date on our website is a mistake." 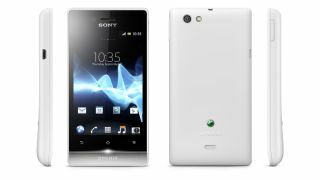 The Sony Xperia Miro may arrive in UK stores sometime this month, as Sony expands its solo-branded smartphone range even more. The Xperia Miro slides in towards the lower end of the market, below the Xperia U, but ahead of the bargain bucket Xperia Tipo, with online retailer Clove claiming it will cost around £125. When we got hands on with the Xperia Miro last month we were told it was due to land during the third quarter of the year (July-September). It looks like this will indeed be the case with high street retailer Carphone Warehouse updating is website listing to say: "expected August 2012". There is that popular little asterisk next to the release date for the Xperia Miro, which takes you to some small print notifying us that the "date is subject to change", although Carphone Warehouse must have had a word with Sony to be able to put August on its site. The Sony Xperia Miro packs a single-core 800MHz processor, 3.5-inch display, 4GB of internal storage, 5MP rear camera, front facing snapper and runs Android Ice Cream Sandwich, so keep you eye out for more news if it takes your fancy.